Sitting in front of the house. 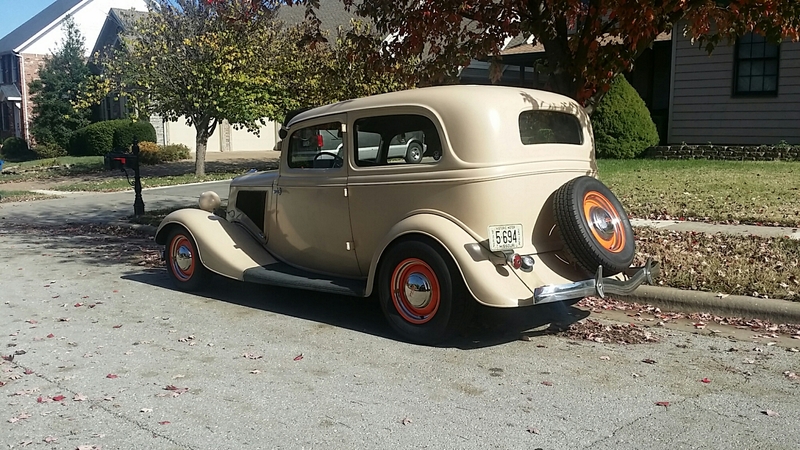 Back in the early part of 2009, Doug and I started a project to get Dad’s ’34 sedan back on the road. Dad was somewhat excited about it, but wasn’t sure how much “fun” it would really be. He had talked about having us put an automatic in it, but we fought back a bit, as it would require a whole lot of stuff that we honestly didn’t feel like we really wanted to do at the time. Sitting outside of my house, getting ready to take it down to the shop. 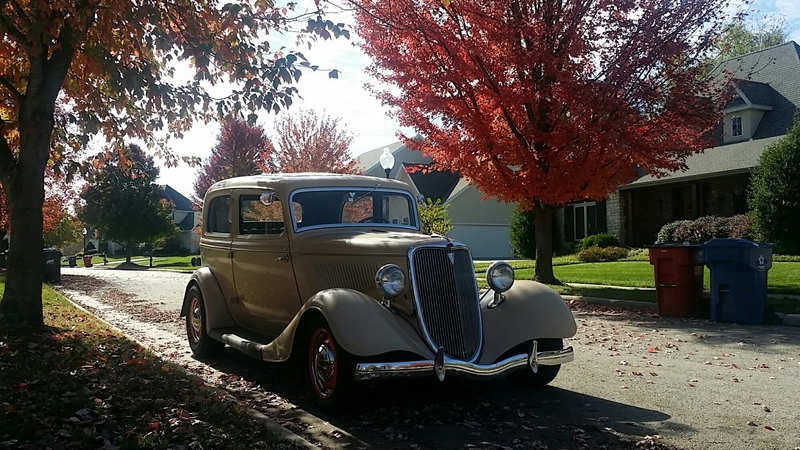 Back in November, Dad brought the ’34 back down to Springfield, so that Doug and I could finally do the stuff that we should have done in 2009, and put an automatic in the car. 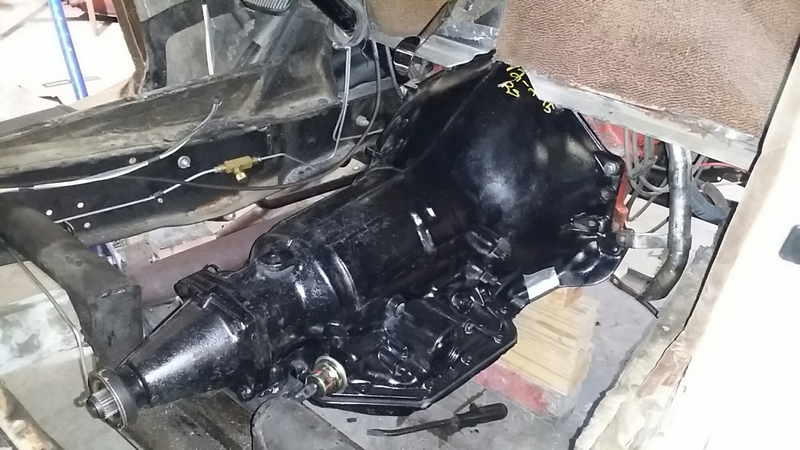 The old 3 speed, while fun to drive, had shortened swing pedals that were connected to a very stiff hydraulic clutch setup, and the throw of the 3 speed shifter put the 2nd speed position up under the dash, which meant that unless you had gorilla arms, you have to lean way forward. Let’s face it…both Dad and I are not near as skinny as we once were, and well…that leaning forward thing isn’t as easy as it used to be! 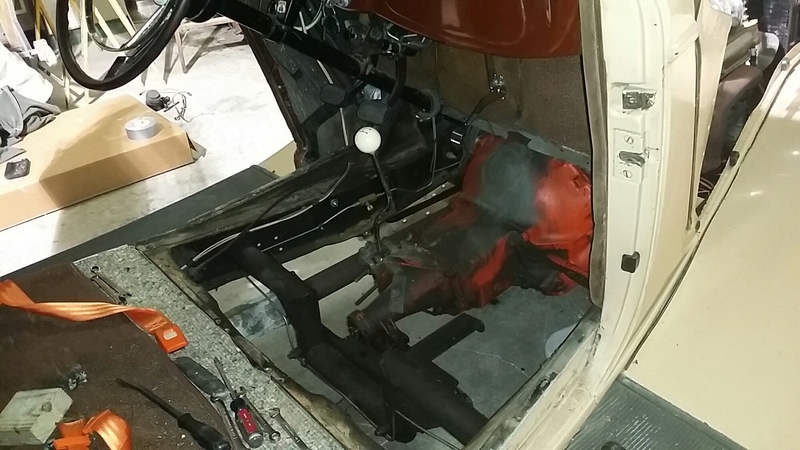 Floorboard out and ready to yank the 3 speed out of the car. We ran into a few challenges. First, we realized that the floorboard that was in the car had been sloped upwards, ultimately around 3″, which robbed a lot of leg room. This was done to avoid having to build a transmission tunnel. With the 350TH transmssion, since we were going to have to create a tunnel, we figured we would drop the floor back down to where it belongs. This will allow a more comfortable seating position. Since Doug builds fiberglass bodies, we figured the easiest thing to do was to create some patterns and lay the floor as fiberglass, and it will be better than the aluminium that we pulled out. 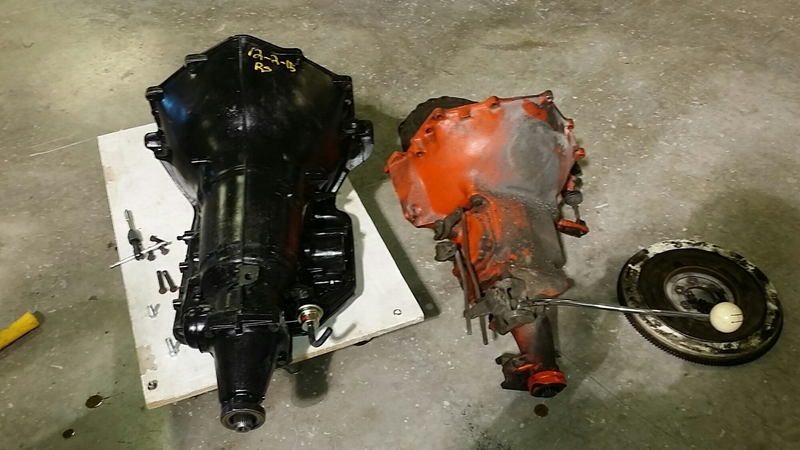 Old transmission out. We actually took it out through the car, versus dropping it out the bottom. 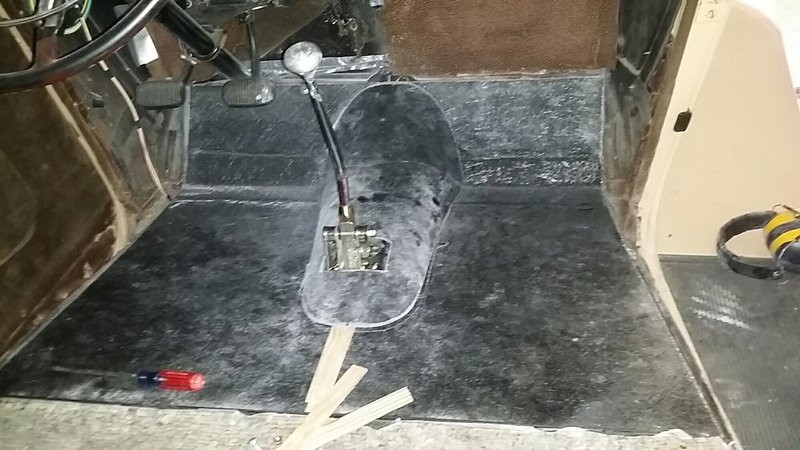 The floorboard was sitting on some angle iron that caused it to have about a 3″ rise at the kickboard area. 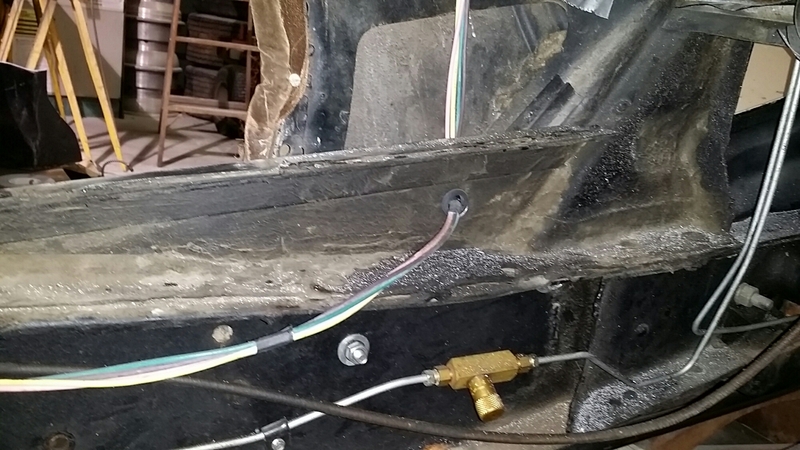 The new floorboard will sit on the lip of the body, just above the top rail of the frame. 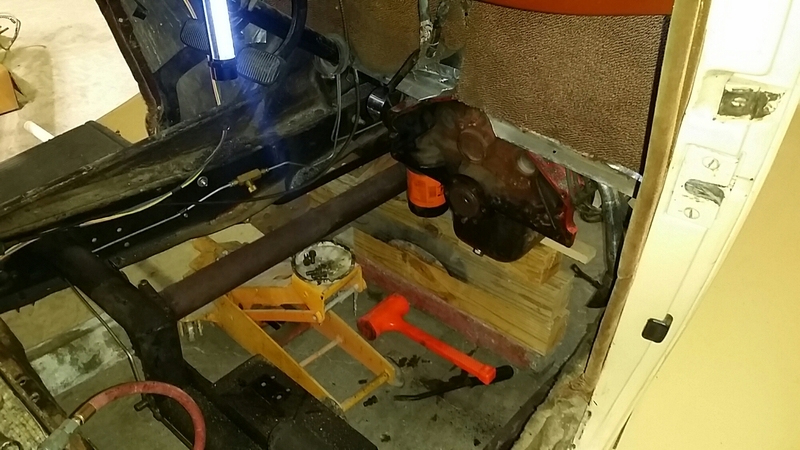 Surprisingly enough, the automatic bolted right up to the existing transmission mount! Cardboard template made for the floor. 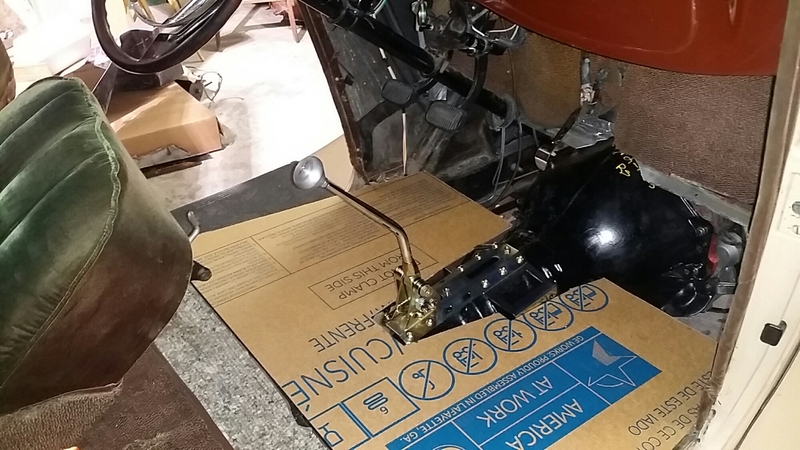 New fiberglass floorboard in place while we mock up the transmission tunnel. After that, I think it’s fire it up and take it for a test drive, which usually means driving from Doug’s shop, in Highlandville, up to Nixa, for Taco Bell. By the way…I have to congratulate Dad. He bought the car in ’70, and pretty much parked it around ’75. We got it back out in ’84, and he drove it a few times before he parked it in ’85. Since we gave it back to him, in ’09, he’s actually driven it longer than the whole time he’s owned it! The past two weekends, we didn’t have a chance to work on the car, but hopefully we can knock out the short list next week and get it moving under its own power again. Here’s to hoarding vacation days to the end of the year and having a great project that will help Dad continue to have fun playing with cars!